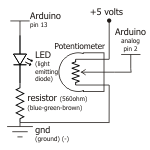 Along with the digital pins, the Arduino also has 6 pins which can be used for analog input. These inputs take a voltage (from 0 to 5 volts) and convert it to a digital number between 0 (0 volts) and 1023 (5 volts) (10 bits of resolution). A very useful device that exploits these inputs is a potentiometer (also called a variable resistor). When it is connected with 5 volts across its outer pins the middle pin will read some value between 0 and 5 volts dependent on the angle to which it is turned (ie. 2.5 volts in the middle). We can then use the returned values as a variable in our program. This is most likely due to a slightly dodgy connection with the potentiometer's pins. This can usually be conquered by taping the potentiometer down. You can try operating the circuit upside down. Sometimes this helps. This is a really neat example and brings a couple of circuits together. 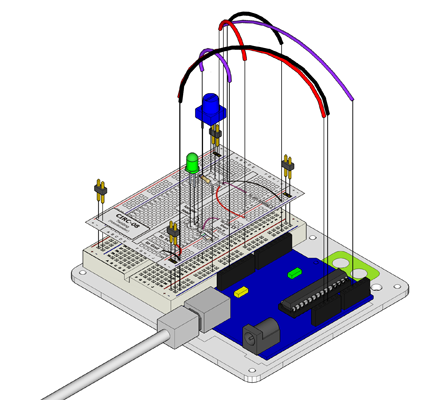 Wire up the servo like you did in CIRC-04, then open the example program Knob (File > Examples > Library-Servo > Knob ), then change one line of code.
.: Welcome to the Bottom:.